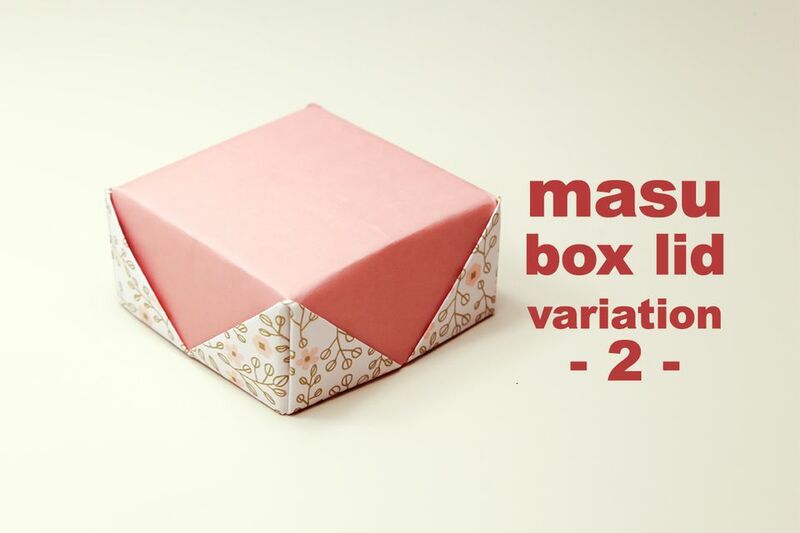 Here is the second variation of the traditional origami masu box, folded the same way as the first variation, but folded more to leave an even bigger space at the top. These variations are inspired by the way that the origami lotus flower is folded. You can check out the first variation here. You will need one sheet of paper for this lid. I used paper that's 20 x 20 cm. Also in order to make a box that this lid fits onto, start with paper that is 13.5 x 13.5 cm - learn to make that box here. If you'd like to start with different sized paper, you can work out what size you need for the base by dividing the size you start the lid by 1.42. E.g: 20 ÷ 1.42 = 14 cm. Then you need to subtract 0.5cm to 1cm depending on the thickness of your paper. Watch a video tutorial of this model here. Start white side up - this side will be the colour that's on the top. 1. Fold the paper in half top to bottom and right to left. 2. Fold the four corners into the center. 3. This is what you should have. 4. Flip the paper to the other side. 5. Fold all four corners to the center. 6. This is what you should have. 7. Fold the top and bottom edges to the center and unfold. 8. Fold the left and right edges to the center and unfold. 9. Unfold the whole thing to the side you started with. 10. Fold all four corners in as shown. 11. This is what you should have now. 12. Fold all four corners in again as shown. 13. Flip the paper over. 14. Fold the top and bottom corners into the middle. 15. Fold the top and bottom edges to the middle. 16. Assemble the box by lifting the right edge and bending the top layer as shown. 17. Fold the right layer over and inside the box. 18. Do the same on the left side. 19. Straighten out the box. 20. The box is complete!